Many parents worry that their children are not eating enough or enough of the right foods. Fussy eating can be incredibly frustrating for parents who are trying to create meals that every member of the family will eat night after night. There is no one quick fix. It takes time for children to learn to like new foods. Most kids go through a picky phase at some stage in their development and some last longer than others. You may have a child who tries everything and likes almost everything, while others are just the opposite. If you have the latter in your house, fear not, it does get better, just very, very slowly. Try not to limit your meals to only the food that your child currently accepts. Continue to bring new ingredients into your repertoire even if they have been previously rejected. They won’t learn to like it if they never see it, smell it or eventually try it. That doesn’t mean serving your child a meal full of foods they dislike. Ensure there is something on the plate your child will eat. For example, if veggies are the problem but they like chicken, potatoes and fruit, serve all those things but add a few pieces of vegetables with it as well. I know they won’t eat it today and likely not next week or maybe even next month. However, they will watch you eat it; watch their siblings eat it; they will smell it; and they will see it on their plate. In essence, they are becoming familiar with this new food. Familiarity is the first step on the journey towards acceptance. It may take a number of “plate visits” (that is, no eating just watching) before a child accepts a new food. Each child is different and of course each food is different. Learning to like apples or strawberries may happen much faster than learning to like mushrooms or asparagus. We are playing the long game here folks. As important as familiarity is, so too is an unpressurized environment. Avoid putting pressure on your child to eat the new food as this creates anxiety around eating. Your child may dig their heals in simply to save face and you have a battle on your hands that is less about the food and more about not giving in. You can always suggest and lightly encourage that they try it, but leave it at that. Once children are sufficiently familiar with a food they are more likely to try it and more likely to accept it and return to it at future meals. Familiarity with a food and eating in an unpressurized environment are the key factors to fostering food acceptance. Tasting a new food is ideal; however, smelling, touching and even just looking at a new food are also very helpful in giving a child the chance to become familiar with that food. So, with that in mind let’s look at a few tips to help foster familiarity with foods. 1. Take your child shopping with you. Let them touch and sniff and smell the produce. Allow them to choose some items of the menu for that night. Try to incorporate both accepted and “not yet accepted” foods. 2. Let them help in the kitchen. Top and tail green beans. Snip pre sliced peppers into bite size pieces. Separate cauliflower into its florets. Measure out ingredients and add to bowls. Get out ingredients from cupboard, clear cutting boards to sink etc. Bigger Kids can be even more help. Allow them to take charge of one dish, perhaps a salad or stir-fry (with supervision). Make sure they taste the food as they go like a real chef. Children love to be independent and you may be surprised to see what your child serves himself when given the opportunity. You may want to invest in a Lazy Susan if you have little kids as they love spinning it so much they tend to put everything on their plate. That doesn’t mean they’ll eat it all tonight, but again, they are becoming familiar with it and maybe next time they’ll be ready to try it. This is a family meal that kids of all ages can help prepare. Let your little ones slice up the peppers with their scissors, measure out ingredients, mash the avocado, squirt the lemon etc. Serves a family of 4-5. Preheat oven to 350° F. Wrap tortillas in tin foil and place in oven until heated through, about 10 minutes. Heat oil in a large sauté pan over medium-high heat. Add onion and cook until translucent, about 3 minutes. Add peppers and garlic, stir for another minute or two. Add turkey to pan and break apart the meat with the tip of a rubber spatula. Stir while cooking. After about 5 minutes as the turkey cooks through, add spices, salt and tomato paste and cook for further minute. Add broth and stir. Turn heat down to a simmer and partially cover with a lid. Stir occasionally, until liquid becomes thick and clings to meat, about 5-10 minutes. Finish with cilantro, if desired. While meat is cooking, make the guacamole. 1 ripe avocado, stone removed and mashed with back of a fork in a bowl. Combine all ingredients in a bowl and mix to combine. Taste and add any options your family would enjoy. 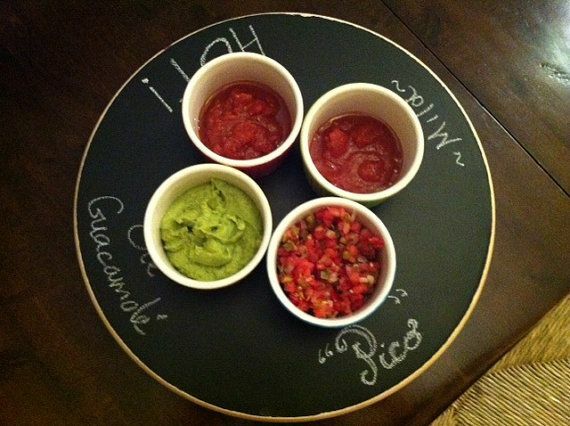 Put all the accompaniments in bowls on a Lazy Susan. Let kids serve themselves, although you may need to help them roll up the tortilla. Enjoy!